ENGINE: 1.6-litre T-GDI twin-scroll turbocharged four-cylinder (201 hp, 195 lb/ft). I had barely made it out of Hyundai Canada’s driveway when I popped the clutch and let her fly, engine and exhaust roaring, tires shuddering as they slipped and gripped at the asphalt of the quiet, corporate road. The torque steer of front-wheel power delivery tugged at the steering wheel as the g-forces of acceleration shoved me deeper into the sport seat. I started to grin. “Ah, there you go,” I muttered, patting the stick shift of the 2015 Veloster Turbo and easing off the throttle after that brief burst of automotive hubris. It was pretty much the same reaction I’d had the first time I drove the turbo version, not long after its initial unveiling for the 2013 model year. It takes a lot of time and effort to bring a new car to market; so automotive manufacturers prefer not to shoot their bolt all at once. They tend rather to string out the release of new product over the course of the following years, re-stoking consumer interest with follow up versions, maybe adding a more powerful engine alternative, or by adding new technologies, new options, new colours every year, or even by varying the lineup with entirely new models. Ditto for Hyundai, the company that brought the new Veloster compact hatchback to Canada a few years ago. The Veloster caused a stir with its aggressively styled curves and lines, combining a road-hugging sporty stance with K-tailed, chopped teardrop aerodynamics and Hyundai’s trademark “Fluidic Styling” touches. Frankly, there wasn’t anything else on the road quite like it and it drew comments for it UFO-like, hunkered-down styling and youthful character. Early adopters snapped them up as a unique and personal fashion statement. Those kinds of customers tend to focus more on form than function and the 1.6-litre four-cylinder engine’s 138 hp was probably judged as adequate to suit the style and day-to-day commuting demands. But I think a different pool of customers, gearheads with performance inclinations, were holding out for the engine the Veloster deserved. 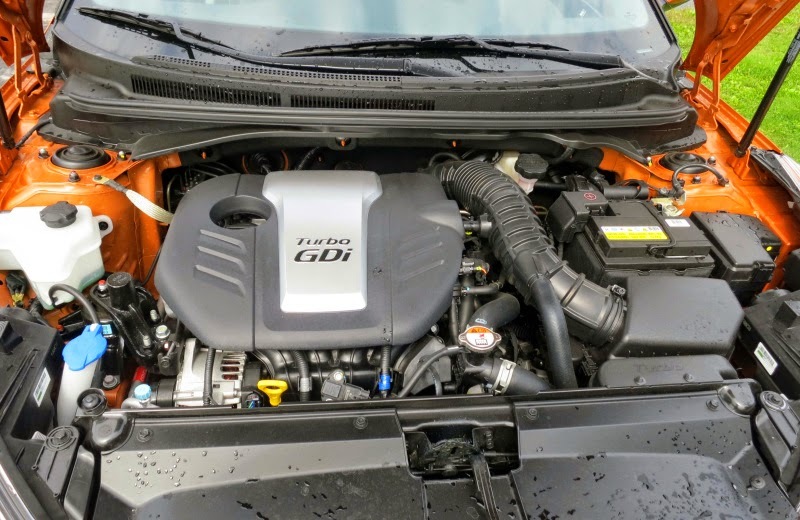 And they were rewarded a short year later with the debut of the Veloster Turbo, a performance-oriented sibling boasting a twin-scroll turbocharged 1.6-litre T-GDI engine rated at 201 hp and 195 lb/ft of torque. That’s almost half as much power again, compared to the entry-level naturally aspirated engine. And this turbo makes that power honestly, running thriftily on regular octane fuel. Fuel economy doesn’t take much of a hit with the turbo, returning a 9.7/7.0L/100km (city/hwy) rating compared to the starting lineup’s engine rating of 9.0/6.7/100km (city/hwy). My real world results from mixed driving in a Veloster Turbo, including occasional bouts of insanity and adrenalized acceleration, worked out to 8.4L/100km (comb). 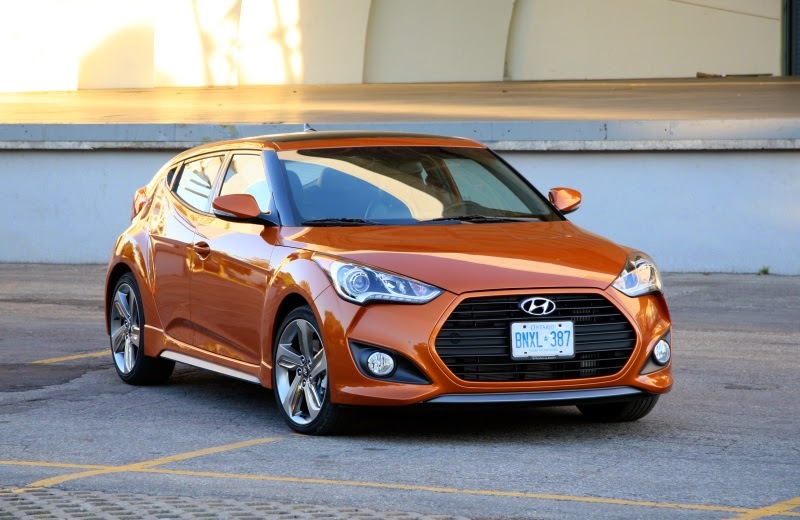 Hyundai’s lineup of regular 2015 Velosters runs the gamut of trim levels, from the base model to SE and Tech versions. Prices range from $18,299 – $23,799. Two transmissions are available – a standard six-speed manual gearbox or a six-speed EcoShift Dual Clutch Transmission (DCT) ($1,400). 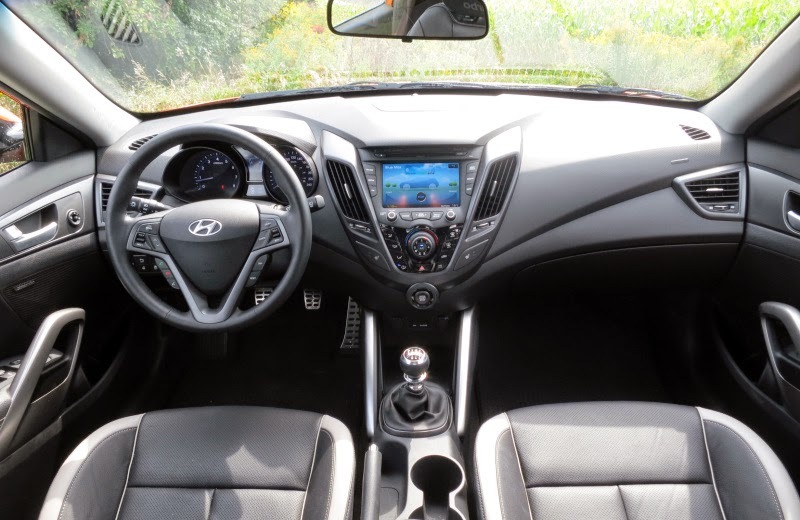 As tested here, the 2015 Hyundai Veloster Turbo starts at $26,749 and, as you’d expect from the price, along with the added power, the Turbo comes with a longer list of included content, items like climate control, a panoramic sunroof, Bluetooth connectivity, a 115V AC outlet and a seven-inch touch screen showing navigation and rearview camera images along with an eight-speaker 450-watt Dimension audio system with external amp and subwoofer. The front seats are heated and roomy enough. As in most coupes, the second row seems an afterthought, suitable only for punishing the occasional extra passenger. But the Veloster does manage one neat trick. It is a three-door vehicle with an almost seamless, forward-hinged third door tucked behind the passenger door. It’s easy to pooh-pooh this extra entry to rather cramped rear confines but, the fact is, the third door does allow easier access to the second row for the stuff you normally throw in the back seat, or even for an infant seat, which means that for young couples starting families, the Veloster is actually a viable bridge between two-door sportiness and four-door practicality. The view back through the split rear window takes a little getting used to but the hatchback opens to 440 litres of luggage room. Along with increased interior content, the Veloster Turbo sets itself apart from the rest of the lineup with a bolder hexagonal front grille, sculpted side skirts and bigger 18-inch alloy wheels. Hyundai introduced a new Sunshine Yellow colour for 2015, only available in non-turbo versions, so our tester is resplendent in the Vitamin C shade of orange that has become the iconic colour of Turbo models. The Veloster Turbo also features a rear bumper with prominent diffuser vents in the lower fascia and with wider diameter, noisier exhaust outlets instead of the standard Veloster’s trapezoidal centre exhaust. The acceleration drama gets an assist from an Active Sound Design system that pipes a little extra intake and exhaust sound character into the cabin. Our tester came with the standard six-speed manual, a throwback bone for the nostalgia crowd, but the more pragmatic six-seed automatic ($1,300) with Shiftronic manual mode and steering wheel-mounted shift paddles would make much more sense, especially in quick response to the turbo power. The Veloster comes loaded with a full suite of electronic brake control, Traction Control, a Vehicle Stability Management (VSM) system that manages the ESC (Electronic Stability Control) and the Motor-Driven Power Steering (MDPS) and, in the Turbo model, Active Cornering Control (ACC) that uses active individual wheel braking to improve cornering grip and traction. The only other optional thing owners might consider adding to this already unique vehicle is an optional Matte Grey paint job ($1,000), a first for Hyundai and a flat paint finish with the kind of awesome street cred, usually only found on pricey imports. 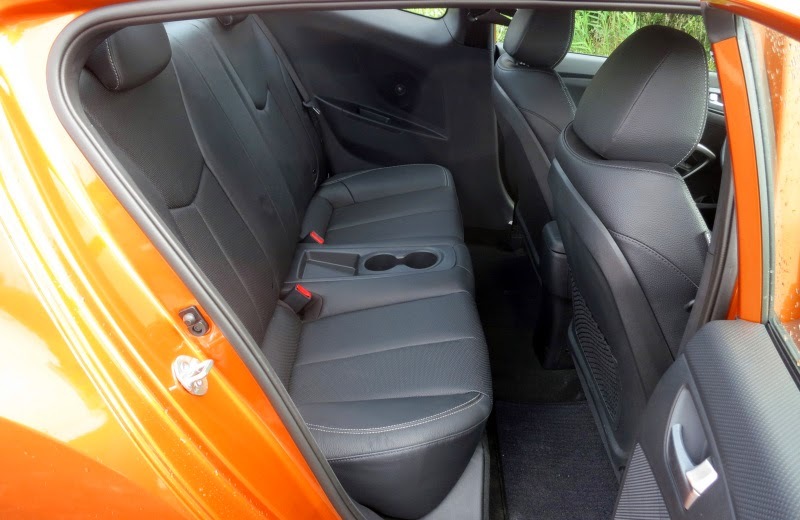 The Hyundai Veloster is worth a look, in regular trim for those who simply like its style, or in Veloster Turbo form for those who prefer a little performance edge added to their fashion statement. One final note – at the time of writing this Hyundai Canada was offering leftover 2014 Veloster Turbo manual transmission models at prices slashed by $7,000, an opportunity to acquire extra performance at bargain prices.